Housed in an elegant 30ml glass bottle equipped with a convenient pump dispenser, the Sparkling Foundation Primer is a lightweight gel primer infused with a subtle sprinkling of golden shimmers. The shimmer dispersion is quite sparse (click on the swatch below to enlarge) and because each particle is so fine, the shimmers won't really show up unless you plan on wearing the primer all on its own. The water and alcohol formulation base is lightweight and non-greasy and the primer also contains glycerin, orange flower water, hyaluronic acid, white lily extract, and jojoba oil. The primer spreads evenly on the skin and it quickly absorbs to reveal a smooth and non-sticky texture. Although the product contains some silicone, its finish is not heavy. The primer honestly just feels like a lightweight gel moisturizer; it's not really smoothing or blurring but it does lightly hydrate and prep the skin. If you have normal to oily skin, you can probably use it in place of a pre-foundation moisturizer. 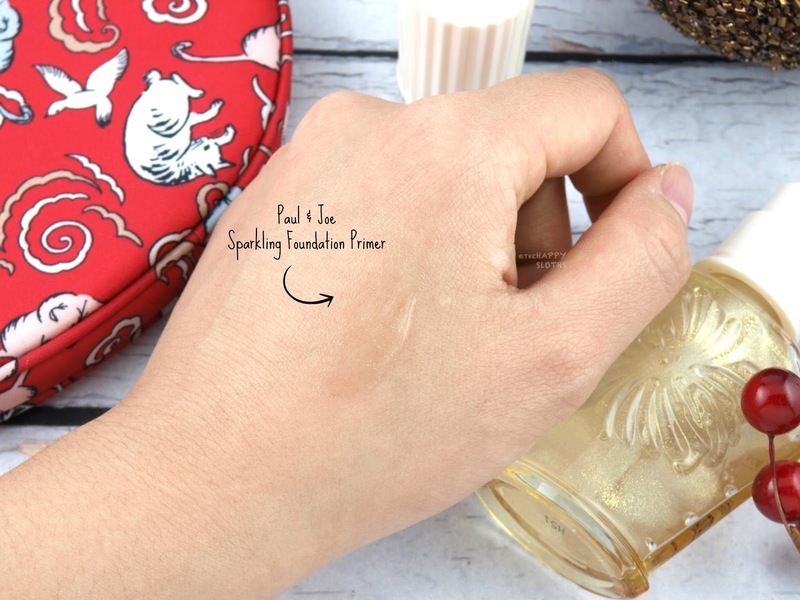 Lastly, the Sparkling Foundation Primer has a light floral fragrance that's subtle and pleasant. 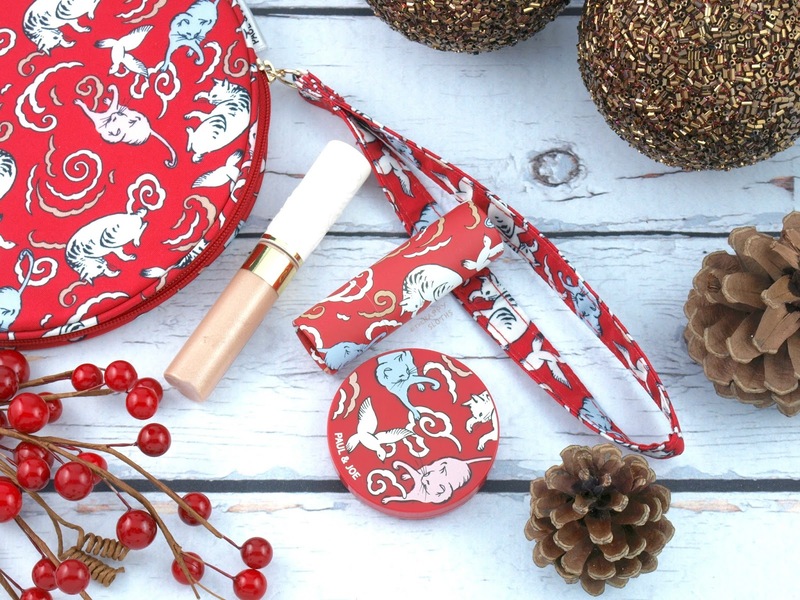 Available as a three-piece gift set, the Holiday 2017 Makeup Collection comes in a gorgeous pouch sporting a festive kitten theme that runs throughout the entire collection. You get a small compact powder Shimmering Blush (3g), a liquid eyeshadow "Eye Gloss" (5.8ml), and a cat-shaped Lipstick Limited (3g). The star of the set is undoubtedly the beautiful cat-shaped Lipstick Limited in "003". 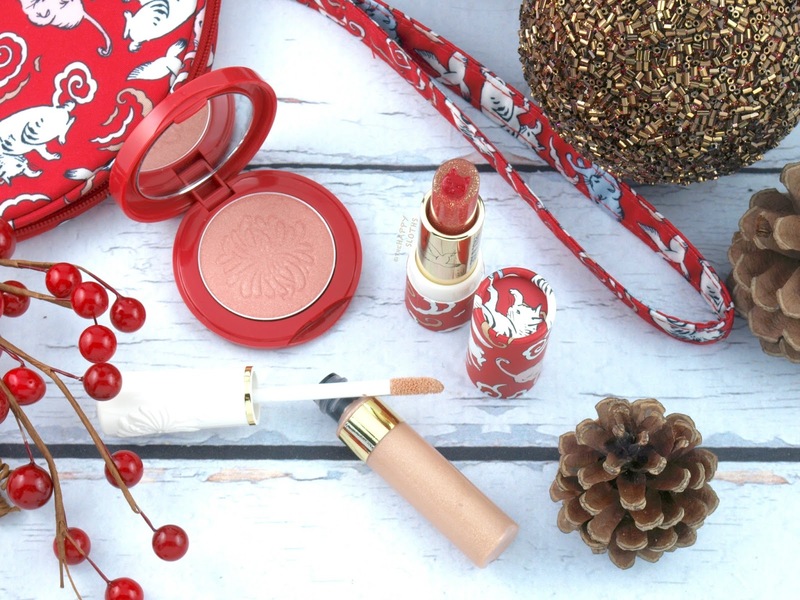 The design features a festive red core surrounded with a clear balm filled with subtle golden shimmers. I didn't have the heart to swatch and ruin the cat design but I presume those who get the set will also be keeping the lipstick as a part of their "display-only" collection. Paul & Joe Holiday 2017 Makeup Collection | Lipstick Limited in "003"
The Eye Gloss in "001" is a liquid eyeshadow that comes in a clear tube and applies with a doe-foot applicator. This shade is a sheer warm champagne shimmer. It doesn't have any base pigments so when blended, the shadow provides only a subtle sparkle. The formulation sets completely to a smudge-proof wear but the finish is not waterproof. 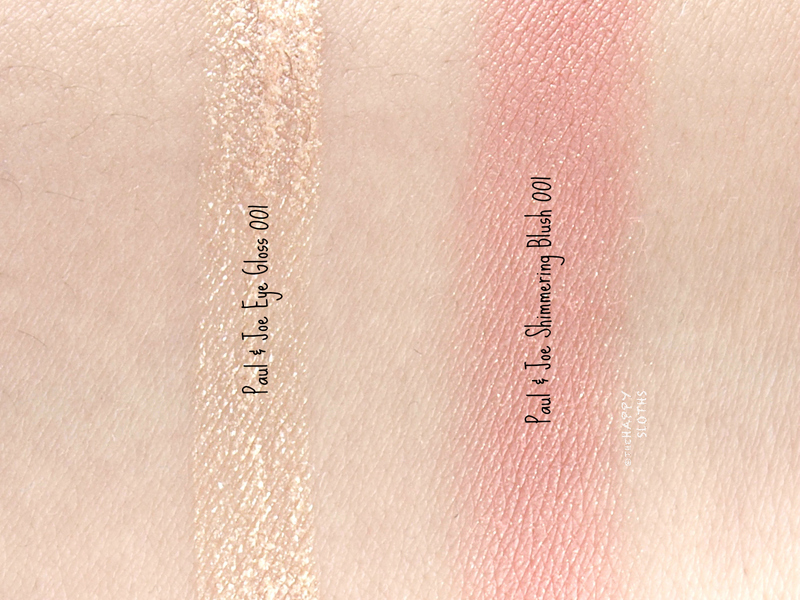 Lastly, the Shimmer Blush in "001" is a pretty light coral pink. The formulation is semi-sheer but very smooth and silky. 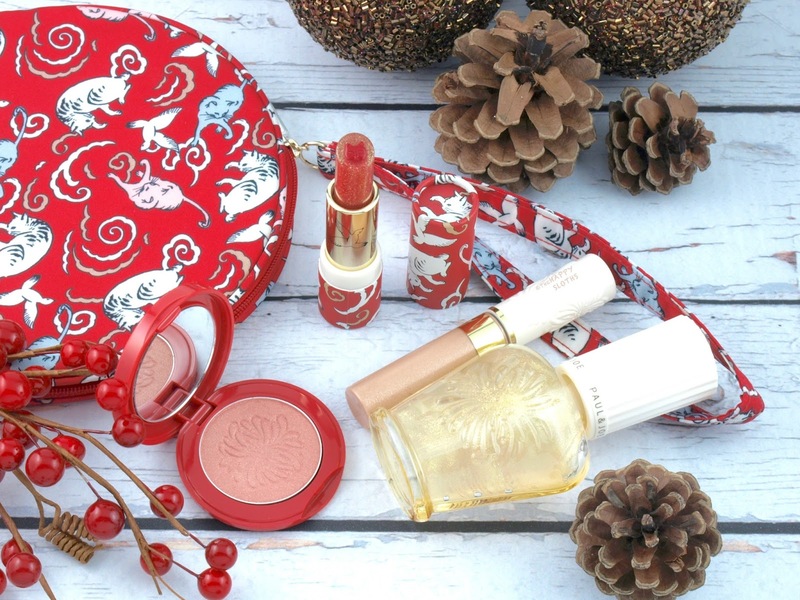 Additionally, the powder is pressed with the signature Paul & Joe chrysanthemum design and the formulation is infused with a gorgeous floral fragrance. Paul & Joe Holiday 2017 Makeup Collection | Eye Gloss in "001" & Shimmering Blush in "001"
Are you intrigued by this collection? 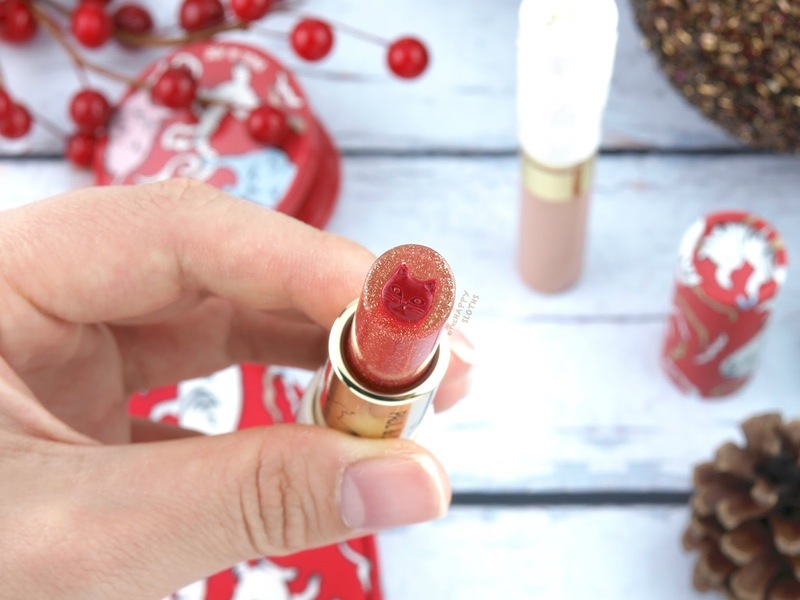 Do you have the heart to use a lipstick this cute? Share with me in the comments below! The Holiday 2017 Paul & Joe Beauté Collection is available starting November 2017 online at beautyBOUTIQUE.ca and in stores at select Shoppers Drug Mart locations.